Holmes Firm PC is your law firm. Our practice areas and practice philosophies support your business goals of experience, efficiency and value when retaining legal counsel. 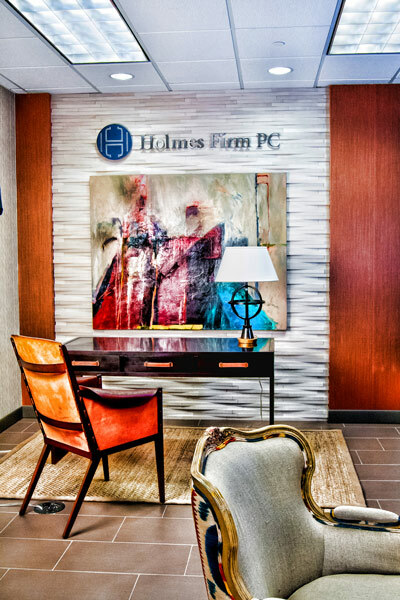 Our attorneys and staff approach each day with the attitude that Holmes Firm PC does not exist but for you. We provide rock solid legal advice, innovative strategic analysis and elbow grease to represent real estate companies, businesses (whether start up or institutional), financial institutions and wealthy families/family offices in our core practice areas of real estate, corporate/securities, intellectual property, employment and litigation. Why choose us? Top academic credentials. A deep and wide base of legal experience. A real understanding of the difference between value of services and hours billed. We appreciate that lives are bigger than billable hours, the next big deal, and the latest court room victory. When it matters, Holmes Firm PC is your law firm. Our practice areas and practice philosophies support your business goals of expertise, efficiency and value when retaining legal counsel. Our attorneys and staff approach each day with the attitude that we do not exist but for you. We provide rock solid legal advice, innovative strategic analysis and elbow grease to represent real estate companies, businesses (whether start up or institutional), financial institutions and wealthy families/family offices in our core practice areas of real estate, corporate/securities, intellectual property, litigation, family wealth planning and employment law. 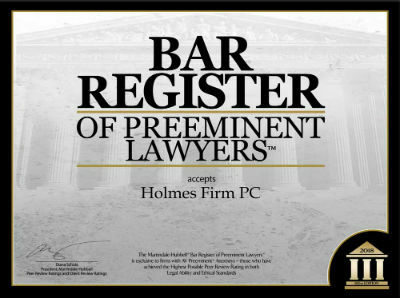 Holmes Firm PC understands we have many worthy competitors for your legal business. So, why choose us? First, all of our attorneys have the academic credentials that allow us to provide to you top quality legal product, whether at the closing table, Board Room or court room. Second, our attorneys are well seasoned and are thus efficient in delivering our services. Third, we understand your need for economy in legal services. Some of our shareholders have been and are on your side of the table as users of legal services and understand the difference between value of services and hours billed. We are also dedicated to our profession and our community, as we appreciate that our lives are bigger than billable hours, the next big deal and the latest court room victory. So, the next time, when it matters, contact us and we will gratefully embrace your legal needs.